A long time ago a group of local moderators on this site decided to make their own mark on the Content branch. Known as the Silver Shield, the publication was one of Content's most popular publications until it was cancelled nearly four years ago. 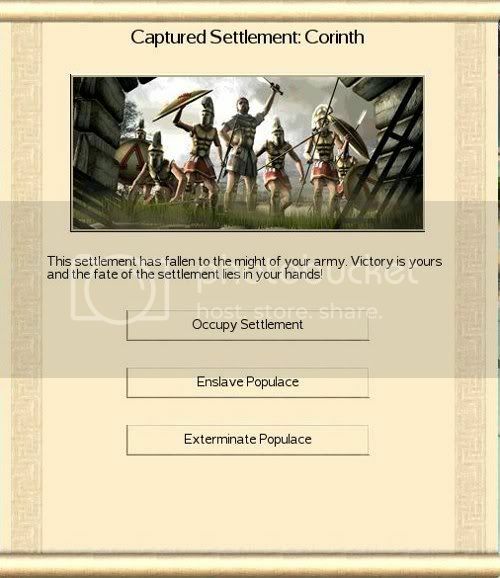 Hidden from the public eye of the site, it has been mostly forgotten by the the membership of Total War Center, save for some old veterans who used to read it fondly. Today, we in Content have decided that it is time to make them available once again. Every week we will publish one of these archived articles for the site to read once more. This will take some time to accomplish as there are many issues, but one day they will all be available for you to read once more. From those who work in Content, we hope that you enjoy reading these voices of the past so that their work can be remembered and never forgotten. My Greetings to the Total War Center Community! I would like to take this opportunity to introduce TWC membership to the Silver Auxilia's very first publication: The Silver Shield. I understand some of you may be scratching your head right now so please allow me to present you with a brief synopsis of who we are and what we're all about! The Silver Auxilia is the largest social group of local moderators within TWC. It was born from an idea that came to mind one day while struggling with what I perceived to be community disorganization. As I continued to ponder this notion of disorganization and how one could make organization of it an idea popped into my head. Conveniently enough 'social groups' had recently been implemented on TWC *surprise, surprise* I know there's a tendency to create a social group for everything these days... But! I had high hopes this would be something more. And so I began a quest to unite the 'gray collar' or "working class" members of the TWC sub fora by establishing a social group. The next step was to give 'it' a name... and after a little consideration I choose to glorify that particular shade of gray assigned to all local moderator name tags. With the inspiration of Rome Total War and fairly precious metal I transformed the gray to Silver. But something more was needed still, we weren't 'Silver' pikemen or legionnaires. Those two just sounded odd and generic and of course period specific and down right silly for a local moderator of a sub forum. So realizing the fact our TWC theme tends to slightly change with each new Total War game release what the group really needed was a timeless and reflective label. "Auxilia" seemed to fit that bill! Since local moderators are not official TWC staff, yet still do considerable work and or service towards many areas of the site I felt Auxilia best described the position they hold here. Now that the name was realized it was time to recruit. After all what good would the group be if no one knew about it? How much networking could go on if we waited for each and every local moderator to discover it? So taking it upon myself to send out what seemed almost endless invitations (my apologies to those I may have missed! Please know all local moderators are welcome!) I proceeded with the task of bolstering the ranks of the Silver Auxilia. The membership began to grow and acquire some notable characters such as the likes of "[USER]Mega Tortas[/USER]" who has become the self appointed standard bearer never ceasing in his talent to rally the troops when necessary! But also many well regarded modification teams have joined such as the members of Broken Cresecent, Dominion of the Sword and The Third Age just to name a few. With our numbers increasing so did my desire to see an actual flowering exchange of ideas, talent, pier review and support. The dream from day one was a freely flowing exchange between the smaller 'niche' forum operators (of say role playing games or other special interests) and the larger hosted modification teams and artists. Within the Halls of the Silver Auxilia these various and otherwise scattered breeds could meet and converse in a casual environment. So that's it in a nutshell! I shall spare you all from any further melodrama, by presenting without further a due the Silver Auxilia's first ever publication. A product of a small voluntary, but still very inspiring staff of members, Local moderators who did a excellent job of high lighting the local communities and their members. Welcome to the 1st installment of the Silver Shield. We hope you will enjoy the read! When did you start playing TW MP? I think 3 or 4 years ago. I'm not sure but I think that the first 'real' time I started was in a PoM tournament, I got my tail handed to me and resolved to become better. I kept losing them, and I decided to really train myself. And that worked! Since then I've won a couple of tournaments, though I'm still no match for more serious players. When did you join TWC? July 22, 2007. I've been here for almost two years really, lurked around like a lot of people, also due to an unfamiliarity with forums. 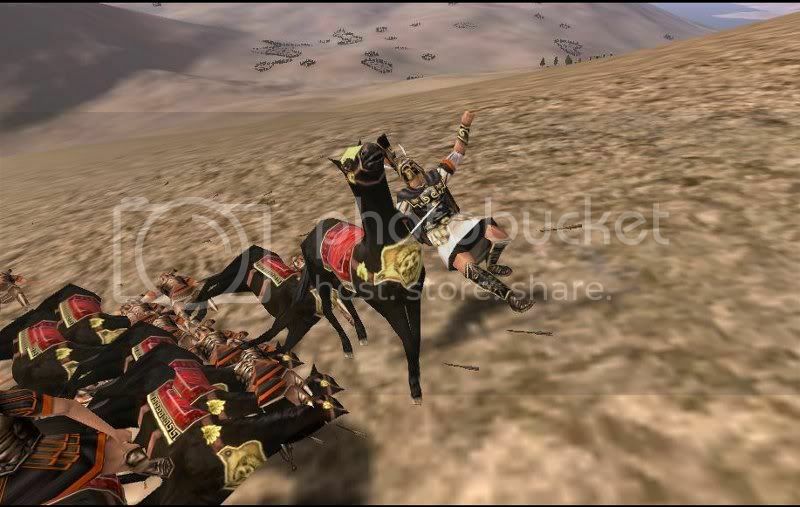 Before I joined TWC, I spent a lot of time at the HeavenGames forum for Total War. It's a great forum, but they are more focused on inner community modding, and on aar's. They've got a couple of great writers there, who can give our local writers a match anyday. I joined here after I met PoM on HG, and he told me that TWC was a good forum, and it turned out to be true! If I'm in any clan, it's the TWC clan. I've never considered joining a clan, because of the spam talk, clan wars, and the arrogance that is prevailing with a good amount of clan-members. If I get annoyed at clan members on this forum, or just by looking at the spam in the lobby, no chance that I'll become one. That said, the clans have some of the best players of RTW, and they provide a good place for people to get better. Any plans on joining the "Dark Side" (Normal MP outside of TWC )? How many Tournaments or awards have you won? Tournament Wins: I've won these tournaments on TWC, and I've won none in clan tournaments or the like. These are the Tournaments on TWC that I won, or came into the finals with. I've participated in one tournament outside of TWC, but was eliminated in the first round. I think I will, ETW looks better with time, but I'll download the demo first once I get my new rig. And with the money I currently have, plus birthday cash on saturday, that should be enough! What you thoughts of TW MP today? On TWC. We have the King of the Hill ongoing tournament, thanks to Xavier Dragnesi, all kudos go to him. Cluny has hosted a couple of smashing tournaments. [user]Njord[/user] (or Loki, as you might know him) has started a new and interesting tournament called Rome Tournament; Rise of a Warlord, check it out, though almost all the seats have been taken. PoM hosted many, many tournaments but has left the RTW multi-player section. A shame, but I guess he prefers to focus on his commentary vids, which are still nice to view. As for the outside world, I get the idea that a lot of clansmen are cocky, which I get from the attitude of some of the people in the MP section. That bothers me, because insulting people left and right isn't really civilized or the proper way of doing things. But that's just the way things go on the internet, the one place where you can nicely anonymously insult people till you're blue in the fingers. 8.Who's a better player, Me Or [user]Prince_Of_Macdon[/user] ? Interviewer's Note: Bull. I am a TW Legend! Don't hand me that crap! Caesar Julianus Morelli: How long have you been in modding? magpie: I have been modding for about 10 years. Caesar Julianus Morelli: Can you tell us a bit about yourself? magpie: Well I am now aged 62, I live in Ireland in an old 18th century farmhouse, which I am trying to renovate. My interest's apart from modding, are history, astronomy and cycling also I am studying on an off for a Bsc in geo physics another of my hobbies. ha ha. Caesar Julianus Morelli: Can you tell us how the idea of making the mod started, and how long had you all brainstormed the mod, before setting out to begin work? magpie: Good question CJM, I have always wanted to do something with the original RTW. I loved the game from the first and have always been grateful to CA for creating it. Loads of ideas would run through my head when playing it, You know the 'what if this was changed' 'how could this be made to look better' etc. What I really liked was the gameplay aspect of the original, I never had a problem with the Roman Senate or the Civil war and the 3 families as portrayed by CA. I hoped that one day I could meet someone with the graphical skills and similar outlook and enthusiasm to work with me in producing an epic version of RTW with most of the original cast of characters under one guise or another kept in. While I was working with limes on his epic AEE mod, Haeressiarch joined us, I loved his style of work and could see he had a great talent, anyway to cut a long story short Haeressiarch left AEE, and at the time my workload was a bit slack. So I contacted him an asked him would he like to remake RTW the original with me as an equal partner. We fired idea's at each other, over what way we wanted it over a few days, had a lot of laugh's and agreed on most things. Haeressiarch came up with a title and we decided to have ago, shortly afterwards haer introduced a friend of his a young lady with a great talent for history and art called hamsha she became the third equal partner in the venture. Hence the Triumvire and RotN was born. Caesar Julianus Morelli: Could you give me a summary of RoTN mod? magpie: To do a brief summery of what RotN will be? Well I think I would describe it as a super version of Vanilla RTW. With the senate and 3 families, missions and civil war, with a lot added to make it more historical as well. Caesar Julianus Morelli: What was the purpose you all had in mind when you decided to make it a mod based on RTW 1.2? Why not 1.3 of BI-1.6? magpie: Our initial idea was to use the RTW 1.2 version as it was the last clean issue in the series. By that I mean all other patches 1.3 and 1.5 were introduced to facilitate the introduction of BI barbarian invasion, just look at the file differences between the patches? However we had one problem? It has become very difficult to obtain the original Activision RTW CD. So we have to develop the Sega 1.5 version as it's still easy to obtain. There will be a 1.2 release for the few of us who still have our Activision 1.2 version. Caesar Julianus Morelli: What, if any features will make your mod different from any of the other mods on RTW out there? magpie: Features? hmm well first class new models of units, new buildings, new sige engines, new horses, new elephants, upgraded scenics, upgraded MM map. TWO roman families renamed to the claudi(bruti) and corneli(scipio) these were real historical families. Other factions also renamed to their historical names. 48 named legions etc. Caesar Julianus Morelli: Historical accuracy, accuracy more than gameplay, or Just beautiful graphics? Which of these will RoTN lean more towards? magpie: Great graphics and campaign play. A huge amount of historical research has been done by Pirates and hamsha into uniforms, faction history ect, I hope we can combine all 3 in the finished mod. Will the mod be too heavy for most computers or will it be lighter then other mods out there? A modern computer with say a dual core and say an 8800 512mb graphics card will give you a good performance, thats our aim. Caesar Julianus Morelli: What is your favorite faction to play, and why? magpie: Favorite faction would be the Roman julii, always been a Caesar fan and the Roman empire is one of my favorite history periods. Caesar Julianus Morelli: Will the time line stay the same or change a bit? magpie: Timeline will be changed. The campaign will begin in 270 BC and finish around 156 AD. We want to show the Republic and Imperial Rome. Caesar Julianus Morelli: So far, are you and everyone on the team happy with the outcome? magpie: The Team I think are very happy so far, we have our debates sometimes a little heated but we all have a goal, to present a great mod for ourselves and the many lovers of RTW in the world. As a signing off gift, would you mind giving all the fans out there some screenshots that you may be hiding? Caesar Julianus Morelli: Thank you for your time Magpie, as a friend and interviewer I wish you all much success in this venture. magpie: Thank you my friend for letting me talk about our great adventure. From all the Team have great adventures magpie. Aster : Why did you build Augustus!? Valerius Tiberius : I built Augustus! because I had discovered a 'mod', made by Myrddraal, which allowed you to control several factions. I discovered the fun of fighting against human controlled nations, and I wanted to do this with more people, and also let these people experience hotseat games too! Aster : Who helped you in your struggles? Valerius Tiberius : I actually started it out alone, but the people who joined in the first campaign, helped to built it up. Some of them have already left, but the remaining ones are the ones that really help. Some of the new people are also very active. Galerius Priscus, Xavier Dragnesi, Decimator22, Delvecchio, Woestelingh, ... to only name a few . Aster : What are your first feelings making it public? Valerius Tiberius : Well we first started out with one vanilla grand campaign. A grand campaign (GC) is a campaign where all factions are human controlled, mostly being 18 factions. This seemed to go a little to slow for most people, since one turn then took a while. The other type, small campaign (SC) seemed to have more success, because it only contained 4-6 players, the turns went faster. There's also a new type coming up, RPC (role play campaign) which I hope will have a lot of success . Aster : How hard is it dealing with feedback, and sometimes bashes and unnecessary criticisms? Valerius Tiberius : That hasn't been a big problem up till now. Some people are angry turns go slow and such, but most people just tell it clearly and calm, and then we can work together to a solution. That's how we came to more SC's, and less GC's. It's fun to work with such a kind of people, and annoying people mostly leave quickly. I think this hasn't been such a problem because I took a lot of time to prepare it. I made Word documents and all, to see how the forum should be, how campaigns should go, and such. At the start, the hardest critisism came from an admin and a moderator, who didn't believe this was good enough to get its own forum. They thought it would be better if it stayed small, in one topic. We then made a forum outside of TWC, and with that, we moved on to TWC itself . Aster : Now how are the rules to play this? Valerius Tiberius : Rules can differ from campaign to campaign, the players decide what they want, and this makes it fun for the players too, cause they can participate in several campaigns, having different rules and playing as different factions. But the general rules would be that you control one faction, and there are several factions human controlled. Now, the only maybe negative point of Augustus! would be that all battles human VS human are auto resolved. Because the attacker that is human controlled would have much more benefit because of the sometimes dumb AI. Online battles would solve this, but then again, they would take too much time. Aster : How would you try to make this unique? Valerius Tiberius : Well it is unique in many ways. First of all, you do not control one character like in other community like YATS or others, but you control a whole faction. The biggest thing that makes it unique, is that you face human opponents, and not AI controlled factions! 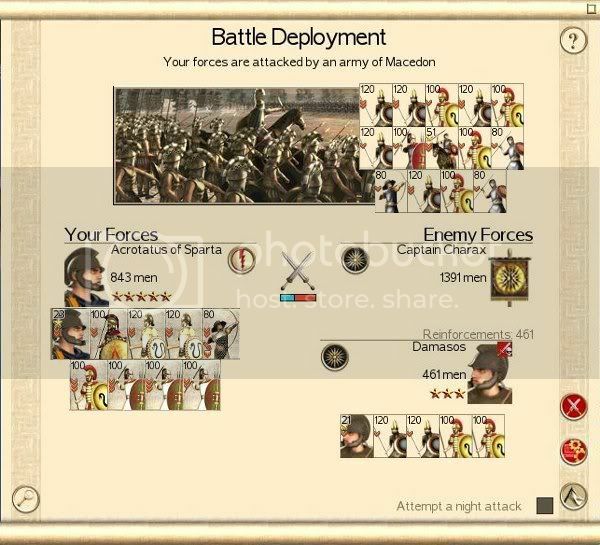 Due to this, you will face a very hard campaign, with hard wars and you WILL have losses, lose a war, then win a war. The diplomacy is also a great benefit, you can negotiate with humans. So you can form alliances, go to war together, backstab if it must . You can make secret deals, have someone as a true protectorate if you have defeated him in war, fight together, .... I could go on for ages! Aster : In the recent RPC : The Gallic Campaign. You took a modding stance to further make this RPG unique. Tell us some details about it, Why did you dare to take this job. Valerius Tiberius : Well someone came up with this after a while, out of experience of other campaigns. We have always used either vanilla games, or mods, but someone said "hey, why not design a mod made for Augustus! ?" So after some talking and planning, we begun. I would like a better mod team though, cause we're doing all the work with few members, and we should be able to work faster and better. These RPC's are actually SC's, but made for Augustus!, on another map, other factions and so on. Here you also controll a nation with 2 players (or maybe more) So the chances of someone being online to play the turn is doubled. With this we hope to prevent slow campaigns . Aster : What are your thoughts with the new stream of visitors in the AAR & CG fora with the coming of ETW? Maybe we'll make a separate part for ETW hotseat campaigns later, we'll see . Aster : Despite RTW has been seemingly replaced by both M2TW and ETW, Why did you still pick RTW as your platform of choice? Valerius Tiberius : Well, M2TW had already hotseat games, with kingdoms. But they didn't seem to pick up very well. I encountered the mod of Myrddraal, and I also saw that many people on the forum asked for a hotseat mod, but few knew it. I experienced how cool it was, and thought that many people would share my opinion. In a few days, many people signed up, and look where we are now . RTW is also a bit more popular than M2TW I think, more people have it and more people still enjoy it. Hotseat for RTW is something new that may let people who already have the game for a while, experience a whole new world. Aster : Any final candies? Valerius Tiberius : I hope to finish the RPC: The Gallic Campaign soon, and I hope a Greek, Roman, Eastern one and so on, will appear too soon . We have recently gone through Reforms, and when the RPC id out i'm planning a front page ad. Augustus! is still fully growing, so wait and see what it becomes, or join and have fun . Thanks Valerius Tiberius for answering my interview! For more info visit the Augustus! forum: Augustus! RTW hotseat/PBeM game, where all or several factions are controlled by human players. We will besiege and take Corinth. I have expected it, the Macedonians cannot bear that her allies to struggle. They have sent people to aid the ailing. Fools.... they do not know the wrath of Sparta! No matter how many they throw against us, we shall prevail! 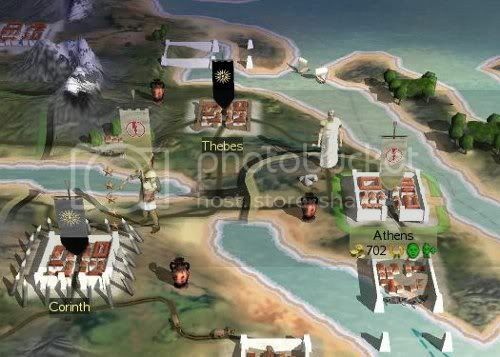 Shortly thereafter, they approached us, it seems that Athens have followed our plans. They have been lured from the lairs, it will only be the time we shall destroy them. Be they sons of Alexander of not, they are the same in our eyes. Damasos, while strikingly has his talent, is too naive to sally forth against his allies. his bureaucratic abilities are absurd at best. I bet his tutor does not teach him well. Mainly because we have people better at management everywhere! The Antigonid is not safe from the arrows of Crete, and the spears of Sparta! Despite having his so-called talent, he is a fool at best. 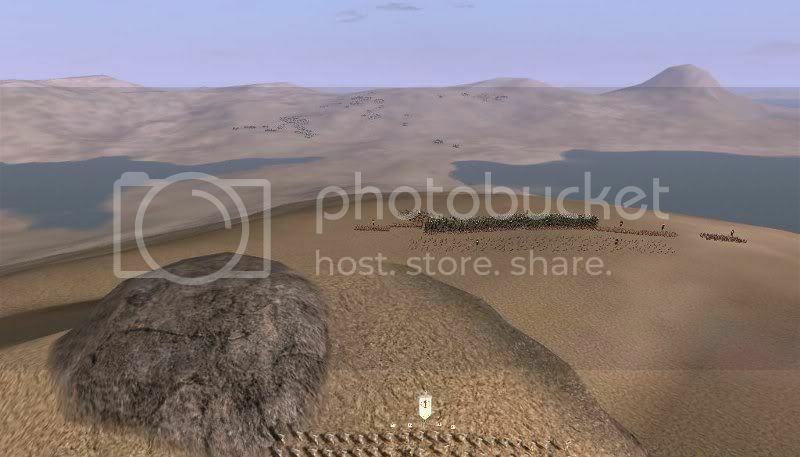 A breathtaking view of the battlefield. The fool has not decided the correct to sally forth against us. The hill shall work into our advantage, do they know about geography at all? I have sent my scout to look over at the enemies, it seems that they are fully confident at victory. Fools, they do not know us well. They will learn to regret ever being confident at us. For we will never give up until die! Meanwhile, their archers and peltasts brings dire threat into our army. Their arrows are quite deadly, despite being outclassed by our loyal Cretans. And furthermore, their peltasts have proved their worth more than once against our armies. Resulting in our defeats, and pushing us back into a corner. It would be prudent for myself to harass them for a while. I didn't suspect they are marching so fast, it seems like they are rushing. While I myself do not know what their motives are, what we can do is only sending our Thureophoroi to rain them their javelins. With this we hope to demoralize them, even by a slight bit. 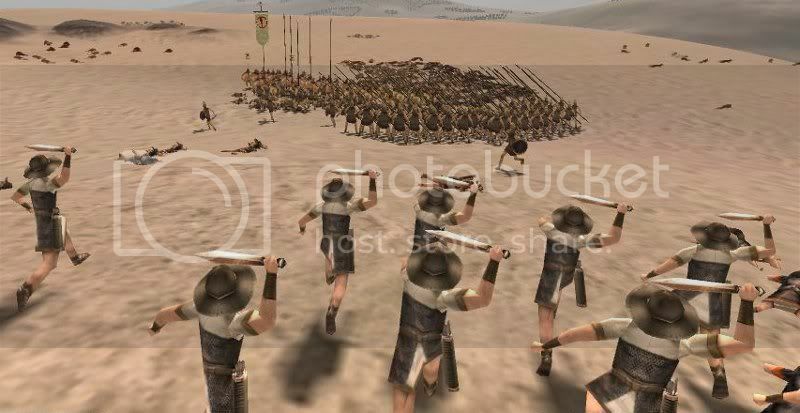 He is quite smart, he sent one of his hoplite units against us, Bah, it does not make a difference if they die for nothing. Have they not known the power of our mercenaries, grizzled in the hot fields of the east? Although I may brag about it, it appears our Thureophoroi are struggling against them. Things may not be very good for us if this continues. . . . The Thureophoroi are struggling against them. 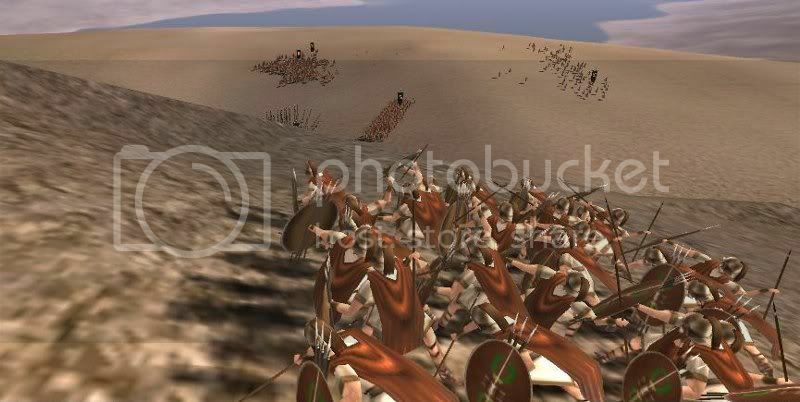 In the meantime, we sent our hoplite unit to hold the main army at bay. I fear they may be shortlived. But never fear, if you die bravely. You will not regret your death, you are the stepping stone to this victory. They seem to fret after a moment, I guess I can only rely on my fellow Spartans after all. 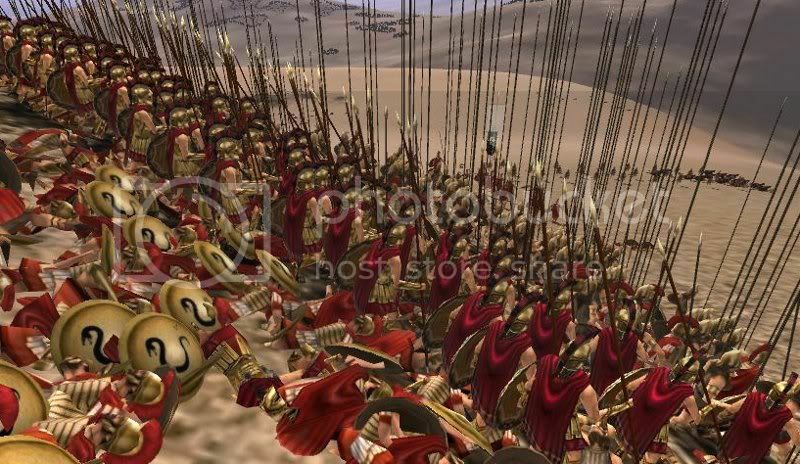 Overwhelmed by the countless amount of Macedonians ranging from hoplites, peltasts to their own Thureophoroi they are scared. Shortly after, they routed. But I think they may still fight..... Perhaps, perhaps. 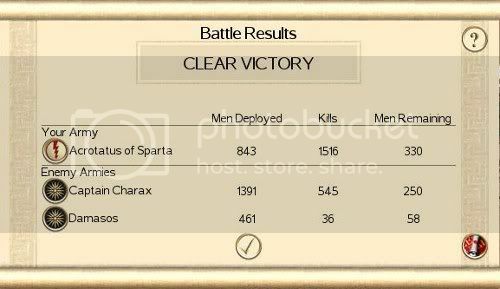 Our mercenaries are almost routed, what's left is one Thureophoroi unit, 2 Militia Phalangites, a Cretan Archer unit and last but not least, myself and the Spartans. 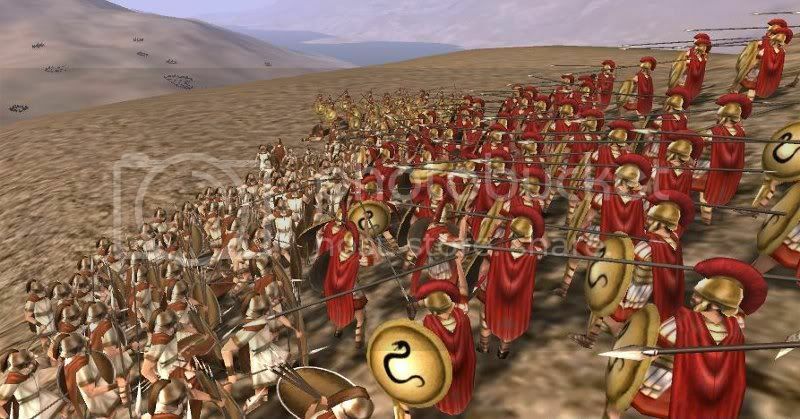 And the Greek Hoplites that are persistent to fight for our glory. Despite being against all odds, the men still shoulder themselves, the morning breeze seems right here in front of us. The leaves rustled and the wind blows gently, as if it is a good luck charm for us. Soon, the men rejoiced. However, even if we put up our defenses tightly. When our enemies do not come, there is exactly no hope that our plan can go in success. It pays to be brave to be able to win. Gladly, I will leave command of the army to Pelleas, my friend and advisor. "Shoot! 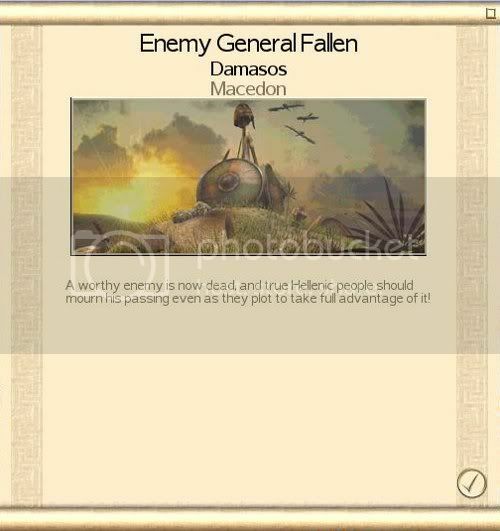 Take Damasos down!" His scream can be heard by myself, and the somewhat sleepy Damasos was unaware of his shout. It granted enough time for the Cretans to aim at his weak spot, namely his heels and his eyes. Sadly, this world will weep at the depart of a talented general. I must march, a whisper come to my ears as I think of victory. A victory is unachievable without bravery. Bravery is unachievable without action. Forward, I shall march by myself. Spartans, follow me behind. 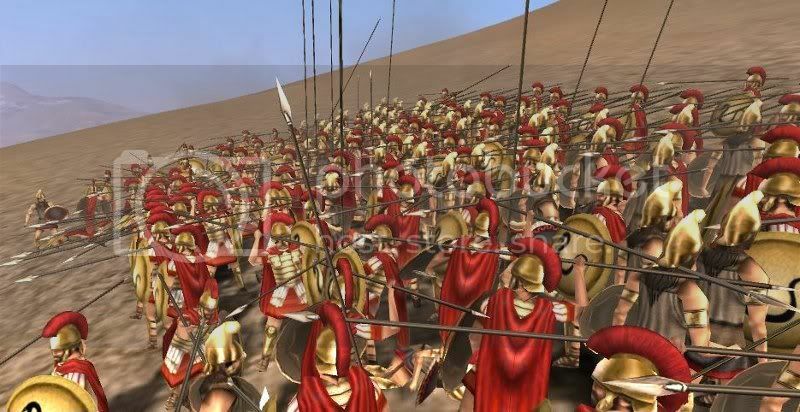 The Spartan Royal Guards who are following me behind have done their work, they have bought enough time for victory and flanking, that which I am not able to do singlehandedly. Their appearances alone scares the enemies in their sight. The spears shall bring them to Hades, let the souls rest in peace. Despite what I did, the wound I sustained was far more than bearable. Blood splattered out of my hands, I peeked in my own body and see stains, red in blood. I will not live a Spartan life anymore. Goodbye fellas, it was an enjoyable experience to fight alongside you. But what I cannot done cannot be done by myself. Regrettably, I will withdraw from military affairs. I am not worthy nor chosen. Promise me, make a strongest army ever........ For me! I do not know what happened afterwards, it seems Pelleas is a much better commander than me. It appears we have taken our enemies down. We have achieved a victory! After this battle, I arranged a meeting with Pelleas, my friend. It is a painful experience so to speak. To think that I would leave the army alone is very unbearable inside my heart. Honor will not speak her way today. Acrotatus : It is quiet at night. . . I have something to talk to you, my friend. Pelleas : What is it, my humble friend? We are victorius at the battle of Corinth! Come on, celebrate it along with us, there is no need to be so quiet like this! Acrotatus : No my dear friend, I wish to tell you something, I. . . I will resign my position. Pelleas : What? How is this possible? No, you must be the leading general! Acrotatus : But it is the truth. . . war is far more than unbearable for me. I will gladly give my position to you. Pelleas : No, I do not want to be a general. You, my friend are far more worthy than myself. Acrotatus : That's all I want to tell you. . . Farewell, my friend. Pelleas : If that's your wish. . . but I cannot. I will still be in the army, just under a different commander. Acrotatus : *weeps* Promise me. .. . Promise that you make the strongest army ever! .. . . . .
Pelleas : I will, despite I'm not the commander. I can see it this time! A few formatting/BB Code errors have appeared but great to see this getting posted. Yeah I can see those but those have been "broken" for a while. Something to fix over time. Unless something has changed I think anyone can access the old forum if they can remember its URL, it was just hidden rather than made private... but I couldn't for the life of me remember what it is, so yeah glad to see these being republished. Also gives you guys something to churn out on the FP when everyone is busy with other stuff which is nice.